The holiday season is very near and it's time for celebration and gift giving. Gift giving is not just for family and friends, but it is also important to give back to mother nature. Reduce, recycle, and reuse is my favorite; thus, here's another tip to save some "moolah" and at the same time give back to the environment. REUSE old calendars most especially those of high quality paper. You will need old or used glossy calendars/magazines, ribbons, gift toppers, and adhesives. Attach the pieces of paper together; then, wrap the gift. 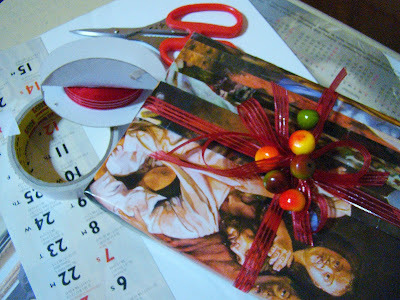 Fold a section of the wrapper to create an effect; then, proceed to embellish the gift with ribbons and gift toppers from Christmas tree ornaments or others. 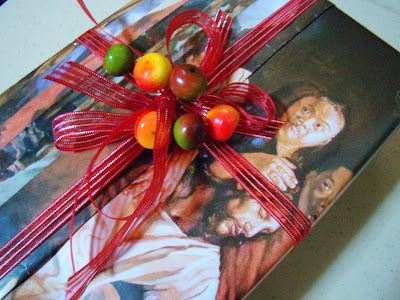 And viola...you have an instant, inexpensive and customized gift wrapper. In this instance, the paper images aptly shows a special child of which the gift's recipient also has a special child. On the side note, if you are faced with a dilemma on how to wrap odd-sized gifts, you can view some videos in "How to Wrap Gifts of Different Shapes". Enjoy wrapping the gifts and Merry Christmas. hohoho! joyeux noel! ...merci Bel!